We are a fickle lot here at The Significant Man. We have decided to go against the grain and try to pick the winner of this weekends AFL grand final in our own unique way. It has nothing to do with team consistency, ball handling skills or even individual player stats. Our system of picking the winner is based on off-field menswear fashion style. So let’s take a look at two big name players from each team. 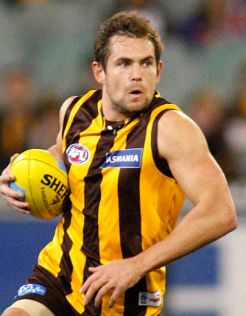 For Hawthorn we have chosen captain Luke Hodge, and for the Sydney Swans it just has to be co-captain Adam Goodes. 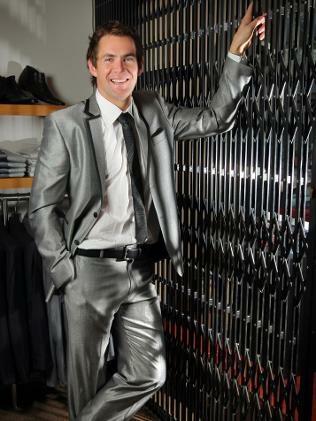 Luke Hodge has a certain effortless charm that allows him to look sharp in virtually any outfit. As a born leader, Hodge can wear something as simple as a plain tank top and still exude confidence and style. Of course, having that confidence can so easily lead to some fashion mishaps. We are not sure what to make of this shiny grey suit with black trims. On the one hand we admire Hodge’s boldness. The suit is certainly a head turner and the matching black tie and crisp white shirt gives it a bit of retro charm. What are your thoughts on this glossy grey suit? For an evening at the Brownlows, I think we would probably go with this more refined look. Luke Hodge brings out his inner James Bond here with his wife Lauren, wearing a classic black tuxedo with bow tie. 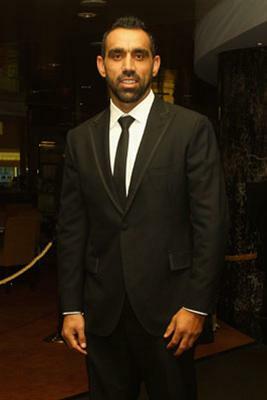 Dual Brownlow medalist Adam Goodes is well known as one the nice guys of AFL football. A superstar on the field, in person he has a relaxed, laid back vibe. We like his casual “just from the gym” look with printed T-Shirt and sweat jacket. 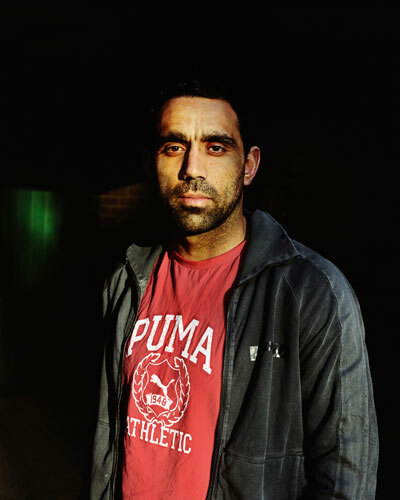 When he steps it up a notch, Goodes shows he has definite style. Check out this three quarter length jacket with open shirt look. This shows some serious fashion chops and suits his size and shape extremely well. In a more formal setting, Goodes continues to show style. This black suit and tie with crisp white shirt ensemble is hard not to like and Adam wears it well. A well fitted suit can always set you apart from the crowd. Once again, it’s almost too close to call! Both Adam Goodes and Luke Hodge have their own distinct style and both men seem to enjoy taking some risks with their menswear. A quick show of hands around The Significant Man office and the AFL grand final style showdown goes to…Adam Goodes! There really is nothing in it. We suspect there may be some suspicious voting from a couple of diehard Swans fans here in the office. Nevertheless, the vote stands. We are tipping a Sydney Swans win on the weekend! Who do you guys think has the style edge? Adam Goodes or Luke Hodge? Perhaps a winner for each category? Men’s Black Tie Style? They both look great so both these great captains share the award.